Having skied the more standard approaches to Middle Sister from Pole Creek trailhead to Hayden Glacier and to the SE Ridge, the NW approach via Obsidian trail and the Renfrew and Collier Glaciers had remained on my agenda for many years. I hadn't made it up this way except for an early October day hike on the excellent 17-mile loop to Obsidian Falls and 7534 ft Collier Cone, at the terminus of the Collier Glacier. For those who might be unfamiliar with the area, McKenzie Pass (5325 ft) on SR 242 is the one of the most unusual and scenic spots on any highway in the US, a barren moonscape of dark lava flows extending for miles in all directions, with over a dozen volcanoes visible from the turret-like observatory constructed out of lava blocks in the 1930s. The snowy flanks of North and Middle Sister dominate the view to the south. In most years, SR 242 remains closed until early July, since snowdrifts linger in the sinuous passages carved through the lava flows and the state doesn't want to bother plowing an economically-bypassed road. For skiers or climbers, this means an extra 5 mile hike or ski is required to reach 4750 ft Obsidian trailhead from the locked gate at 3600 ft Alder Springs campground on the west side. However, this year's miserable snowpack at lower elevations allowed the highway to open before Memorial Day, while spring snowstorms had maintained the snowpack at higher elevations. This year might provide a rare opportunity to ski this route in good conditions as a day trip. Somehow, four weeks had passed since the road opening and I still hadn't made it down there, but finally my day had come. After skiing Snowdome on Mount Hood the previous day (see TAY report), I drove down to Sisters to pick up my Obsidian Limited Entry Permit in the outside drop box and arrived at McKenzie Pass after 10 PM. I decided to car camp here rather than continuing on a few more miles to the Obsidian trailhead and campground, worried about possible mosquito problems there (this turned out to be a very wise decision). The night was warm and nearly bug-free among the barren lava flows of the pass, never dropping below 50 F, and dawn arrived all too soon before 5 AM. I slept in another hour, took some photos, slowly packed my gear, and drove to the trailhead. Mosquitos were already out, and I made a hasty exit up the trail at 8 AM, bringing the 100% DEET along just in case. The hike was quick up the well-designed and maintained trail, with occasional snow patches as low as 5100 ft and a few deep drifts across the trail from 5400 to 5600 ft accompanied by clouds of mosquitos, which I swiftly charged through with minimal blood loss. The trail is again bare up to the crossing of Jerry Lava Flow (view of North and Middle Sister from atop the flow) and White Branch Creek at 3.4 miles and 5900 ft, but then snow coverage increases. I headed left on the Glacier Way Trail (signed Minnie Scott Spring) and quickly ascended to continuous snow 3-4 ft deep by 6200 ft. I switched to skis and skinned up the trail, crossing the PCT at 6400 ft and continuing on the path of the buried climber's trail directly up the drainage towards Middle Sister. The snow was already very soft by 10 AM, a sign that the snowpack had not frozen very well overnight. There were numerous sets of post hole tracks heading towards Middle Sister, and I soon encountered a pair of climbers heading the other way, they had turned around at 9500 ft on the North Ridge at 7:30 AM due to excessively soft snow. Although Middle Sister soon drops out of sight as the slopes steepen, routefinding is easy if you have a map and a plan. I soon made my way to the saddle beside Point 7722, just below the former toe of the Renfrew Glacier (most of the tracks followed the other variation, via upper Collier Glacier). I crossed the ridge which had about 100 ft of bare talus and continued skinning towards the Renfrew Glacier. Looking north, the view included six volcanoes (Belknap, Washington, Three Fingered Jack, Jefferson, Hood, Adams) lined up above 7810 ft Little Brother. This first slope is the steepest on the entire route, perhaps 25-30 degrees, and the snow was extremely weird and unconsolidated on this NW aspect, just like I had seen on Snowdome the day before. I was sinking 6-8" deep into the mush while skinning, but stability appeared to be good as no sluffs were released. I struggled through the mush to reach the large 8200 ft bowl beside the spectacular "Dragon's Back" rock formation (marked "Folding Rock" on some maps; see a 3-shot panorama including Little brother and North Sister, or a 7-shot 180-degree panorama wrapping around to include Middle Sister at 2 resolutions: 2600 or 5200 pixels wide). Beyond the bowl, Middle Sister returns to view and the rest of the Renfrew Glacier is a trivial 15-20 degree slope all the way to Hayden-Renfrew Saddle at 9200 ft. However, the glacier is now mostly receded, as numerous outcrops of glacier-striated bedrock were visible along the route I skinned. I passed another pair of climbers, who had summited via the North Ridge but reported very unconsolidated snow and severe post-holing. High clouds had been moving in just like yesterday, but the solar halos formed this day were even more spectacular, including a double halo above Middle Sister. I reached the Hayden-Renfrew Saddle at 2 PM, with a steady 20 mph wind blowing through the gap and just as a series of lenticular clouds began to alternately obscure and reveal the summit. I had skied the 45-degree slopes of the North Ridge from the summit in June 2000, reaching the saddle from the other side via Hayden Glacier, so given the unconsolidated snow and incoming weather it was prudent not to attempt the summit today. I headed north along the saddle a few more yards to reach a flat spot just west of 9312 ft Prouty Point, from where I took this 9-shot 240-degree panorama showing North Sister, Prouty Point, and Middle Sister (available in 2 resolutions: 3600 or 7200 pixels wide). Around 2:30 PM, I skied through a small V-shaped gap between lava flows and onto the upper Collier Glacier, finding smooth corn-like snow on the northerly aspect, and soon looking back I could see my ski tracks on an endless field of white. After a brief traverse east to explore the 8840 ft Collier Saddle on the flanks of North Sister, I continued down the Collier Glacier to about 8500 ft, where the glacier rolls over and there is a spectacular view of the glacier terminus far below, surrounded by lateral moraines, Little Brother, and Collier Cone, with the distant line of six volcanoes on the Cascade Crest rising above (also see a wide panoramic version). Until the mid-20th century, the Collier Glacier was the largest by area in Oregon, but severe recession has removed much of the glacier below 7500 ft and dropped it into second place behind Mount Hood's Eliot Glacier. From the viewpoint, it was time to angle left off the glacier into the large bowl east of Point 7722 and rejoin my ascent route near 7500 ft. The snow got very mushy and somewhat sticky as I headed NW out the drainage I had come, turning to say goodbye to Middle Sister. I skied out to 6200 ft, hiked down the trail, and as soon as I reached the car I was attacked by droves of mosquitos. It had been another excellent trip in another spectacular area, about 16 miles and 5000 vertical ft of ascent including my side trips for 3200 ft of skiing. I drove back to Sisters to check the weather forecast at the public library (free WiFi, strong enough to surf from a car parked outside even after hours). I was hoping to perhaps ski something on Mount Jefferson the next day, but as expected, the next weather system was approaching bringing mostly cloudy skies, and it seemed best to drive back to Seattle. By the time I arrived home it was after midnight, following an action-packed 43-hour trip with 785 miles of driving, 9500 ft of ascent, and 6700 ft of ski descent. A double solar halo with 22-degree and 46-degree arcs above Middle Sister. The 46-degree halo (lower right) is very rare compared to the fairly common 22-degree halo (at top). Unlike double rainbows, the colors are not reversed in the two halos, because they are formed by refraction through different facets of ice crystals in the stratosphere, not by single and double total internal reflections within raindrops. Click here for an enlarged version of this photo. 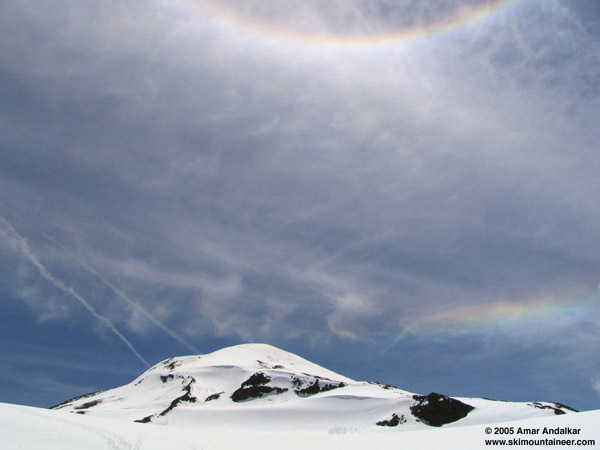 but the solar halos formed this day were even more spectacular, including a double halo above Middle Sister. WOW. A beautiful sun dog. Thanks for the great reports and pics Amar. �Wow, you really packed it into a short trip! Way to go. The snowy flanks of North and Middle Sister dominate the view to the south. Another place to add to my summer hiking list. Thanks!